John Ledyard was the most adventurous of American Founders. 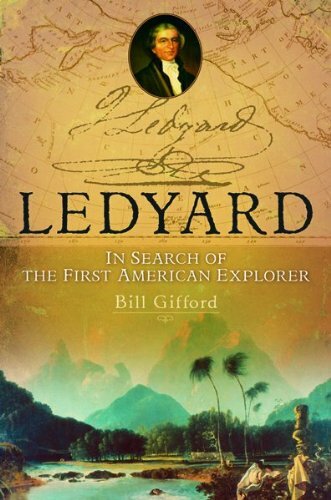 Ledyard was one of the first Americans who could truly be considered an explorer. Yesterday we discussed the Revolutionary Martyr William Ledyard. Today, we will dive into the life of his nephew, world-traveler John Ledyard. Despite not playing a role directly in the Founding of the United States, John corresponded with many Revolutionary leaders as well as being one of the first Americans to travel the entire globe. Born in Connecticut, John Ledyard was raised by his grandfather before attending Dartmouth College. John was an adventurous boy, however, and only stayed for one semester. Instead he hopped on a merchant ship and went to sea for a year. This journey brought the 20-year-old to the Mediterranean Sea, then the Caribbean. John had been bitten by the travel bug. There was so much world to see, and he was prepared to see it. Ledyard went to England where he joined the British Navy as a Marine (though tensions were high between the colonists and Mother Country, the Revolutionary War had not yet broken out). As a Marine, Ledyard was station on the ship of Captain James Cook. Captain Cook is legendary in his own right for exploring the Pacific Ocean in addition to his mapping of coastlines the world over. John was fortunate to land this gig, as it quenched his thirst for adventure. The trip lasted four years, during which time he was able to see every continent on the planet. Additionally, he was present for the discovery of Hawaii, making him the first American to set foot on the islands. The group then headed back to the west coast of North America where they traveled as far north as Alaska (again, he was probably the first American to set foot on that soil). One of the men he was accompanied by was George Vancouver, whom the Canadian city is now named after. The expedition returned to Hawaii and Ledyard was present to witness the killing of Captain Cook. After his adventures with Captain Cook, John Ledyard was sent to America to participate in the suppression of the American Revolution. Ledyard considered that a no-no and instead deserted. He finished his education and published the Journal of Captain Cook’s Last Voyage. Although this was not the first publication of the voyage, it was the first by an American and contributed to Cook’s lasting legacy in the United States. John had remained infatuated with the high price seal fur on the west coast was selling for and devised a plan. He wanted to capture seals on the Pacific Ocean and trade them to China for silk which he could then sell to Americans. He had discussions with Robert Morris in this regard, but those plans fell through. John Ledyard decided to sail for France, though he was still unable to find financiers for his business. He did, however, befriend Thomas Jefferson. Jefferson, who was working as Minister to France at the time, found much in common with Ledyard. The two had an interest in the sciences. Reading through their letters, one finds discussions of the Sun’s effect on magnetic poles and the newly discovered mastodon bones. John let it be known he still desired some adventure and Jefferson recommended he travel through Russia to Alaska, then explore the western United States (taking the opposite route Lewis and Clark would use fifteen years later). Although both Ledyard and Jefferson believed they had permission to move through Russia from Catherine the Great, they did not. John got about two thirds through Russia before he was arrested, brought back, and deported to Poland. He went to London in search of his next adventure. In England, Ledyard became a member of the African Association. This group was organized to explore the ‘Dark Continent’ as they called it. John was the first explorer hired for an expedition. He was sent to Egypt and instructed to head west, mapping all that he saw. Unfortunately, Ledyard fell ill upon arrival. He treated himself with medicine that ended up being sulfuric acid. John had poisoned himself and passed away just a few weeks later. Despite all the adventuring, he was only 37 years old. If you would like to read about other Founders who went adventuring, check out these articles on Daniel Boone and Johnny Appleseed. Although there are several books written about John Ledyard, the only one I have read is ‘Ledyard’ which sparked my interest in the man. You can pick up a copy through the Amazon affiliate link below. Don’t forget to subscribe to the email list for a new article every day.